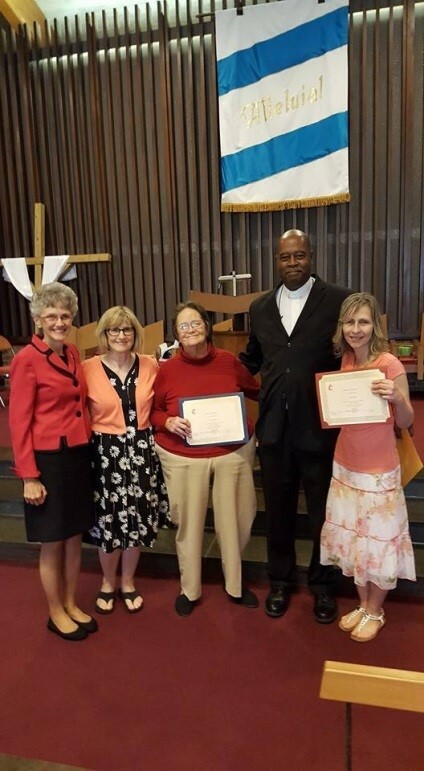 UM Disability: First Deaf CLM -- Leo Yates, Jr.
First Deaf CLM -- Leo Yates, Jr.
Karen Miller, a member of Grace United Methodist Church of Wilmington DE, was recently commissioned as a certified lay minister (CLM). She is thus the first Deaf person certified by the Peninsula-Delaware Annual Conference. She will have responsibilities in deaf ministry in her community. Bishop Peggy Johnson, Rev. 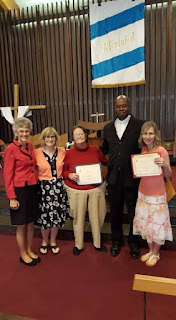 Anne Pruett-Barnett (pastor of Grace UMC), Ms. Carol Stevens (new CLM), Rev. Derrick Porter (District Superintendent of the Wilmington District), Ms. Karen Miller (new CLM). Karen Miller is the first Deaf Certified Lay Minister in the history of the conference. Also supportive of Miller was her district superintendent, Rev. Derrick Porter. To become a CLM, candidates meet with the District Committee on Ordained Ministry, who approve and recommend them for the CLM track. 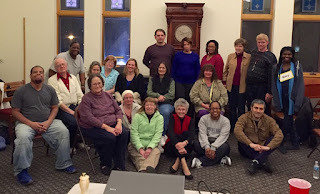 Often, CLMs serve in small membership churches or work within a team ministry as a part of the church’s mission to its faith community and/or its extended community. * CLMs provide servant leadership, offer care ministry, and/or are witnesses to the community. “I feel like I am living out my call in lay ministry; after all, the Apostle Peter said we are a priesthood of believers,” says Miller. Miller explains that as a CLM she will continue to be the lay minister for the Deaf community in her area. She often provides compassion and care to individuals, assists with case management needs, and coordinates Deaf-related events at her church, among a long list of other ministry activities. For example, Miller provided support to a Deaf woman who is a survivor of domestic violence by providing her with education, care, and through prayer. Miller is also the president of the Northeast Jurisdiction United Methodist Congress of the Deaf (www.umcd.org), a caucus recognized by the denomination. No doubt, Miller will be a wonderful CLM, and thus a helpful and caring asset, to her community.